Doctor Who: The Trial Of A Man Playing A Time Lord - Act One | Warped Factor - Words in the Key of Geek. Christopher Morley starts his evidence in the trial of a man playing a Time Lord. 1986, looking back, was a critical year for Doctor Who. The Eighties as a whole had not been kind to the programme itself and now it and its leading man now stood in the dock, the BBC poised to act as judge, jury & executioner. It was against this backdrop that the whole behind the scenes saga would serve as inspiration for an ambitious series arc, The Trial Of A Time Lord. Each episode of Season 23 would serve as a separate act, each supposedly supplying evidence of the Doctor's abuse of the powers granted to him by his very status as one of these temporally privileged Lords of Time. And so we delve into the murky courtroom drama, beginning here with The Mysterious Planet. VALEYARD: By order of the High Council, this is an impartial enquiry into the behaviour of the accused person, known as the Doctor, who is charged that he, on diverse occasions, has been guilty of conduct unbecoming a Time Lord. VALEYARD: He is also charged with, on diverse occasions, transgressing the First Law. It is my unpleasant task, Madam Inquisitor, to prove to the enquiry that the Doctor is an incorrigible meddler in the affairs of other peoples and planets. INQUISITOR: Yes. I see, Valeyard, that it is on record that the Doctor has faced trial already for offences of this nature. His previous date with the law had come about almost inadvertently, himself and the War Chief facing justice as dealt by their own kind at the conclusion of The War Games, the Doctor seemingly punished for attempting to do the right thing! TIME LORD: Not entirely. We have noted your particular interest in the planet Earth. The frequency of your visits must have given you special knowledge of that world and it's problems. Now, three incarnations on from that enforced change of face/personality, legal trouble dogs him once more. And there's something a bit suspect about the judge into the bargain. Going by the title of Valeyard, he watches over proceedings with an alarming level of interest in seeing the defendant punished. So much for impartiality and justice for all. We might also wonder why he's so eager to see the Doctor dead. Events on Ravolox, a future equivalent of Earth going by the Marble Arch sign discovered relatively early on, were presented as his first case for extermination. Shades of both The Face Of Evil & The Beast Below as primitive/repressed humanity & high technology co-exist. And for UK Habitat, as the underground dwellers of Ravolox dub their world, read Starship UK as discovered by the Eleventh Doctor & Amy? DOCTOR: Well, come on. I've found us a spaceship. This is the United Kingdom of Britain and Northern Ireland. All of it, bolted together and floating in the sky. Starship UK. It's Britain, but metal. That's not just a ship, that's an idea. That's a whole country, living and laughing and shopping. Searching the stars for a new home. AMY: Can we go out and see? DOCTOR: Course we can. But first, there's a thing. DOCTOR: An important thing. In fact, Thing One. We are observers only. That's the one rule I've always stuck to in all my travels. I never get involved in the affairs of other peoples or planets. We, of course, know that last bit to be a massive fib! And where the Starship has Liz Ten & the Smilers, Ravolox has Queen Katryca & Drathro. KATRYCA: Rise. You are not from the place of the underground. Where are you from? PERI: Well, it's kind of difficult to explain. KATRYCA: My name is Katryca, I am the leader of the Free. Do you have a name, girl? PERI: Perpugilliam Brown, but my friends call me Peri. Royal intrigue of a sort thrown into the mix, a dash of soap opera if you will. The soapification of Who will continue apace after its triumphant 2005 return. For now though it's back to the courtroom for some closing words from the Valeyard and a lead in to Mindwarp! VALEYARD: Risk! Risk! Hear how the Doctor condemns himself by his own words. INQUISITOR: Gentlemen! Doctor, perhaps you should heed the Valeyard. May I suggest that for the time being you have said enough. DOCTOR: Said enough? Said enough? I have a great deal more to say. And so he will, though his defence will ultimately prove futile. Not that Colin Baker or the man he so passionately portrays here will go down without a fight. All the while, though, a certain Michael Grade, whose personal beef with the man could be seen to have shoehorned into fighting for his very future and that of the role he so adored playing, and still does having been given a new lease of life on audio, was just waiting to wield the axe. "The most damning is still to come. And when I have finished, this court will demand your life." "Any sense of euphoria was muted when the early episodes of The Trial Of A Time Lord debuted to weak ratings -- the long break between seasons and potent opposition from American action import The A-Team taking audience levels below the already disappointing viewing figures of Season Twenty-Two (although the Appreciation Index generally improved). 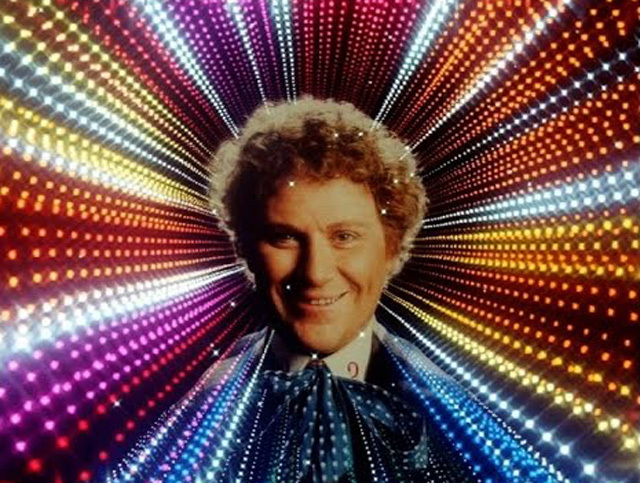 And then, on October 29th, any euphoria was silenced altogether when Nathan-Turner was compelled by Powell and BBC1 Controller Michael Grade to inform Colin Baker that he was being replaced as the star of Doctor Who."